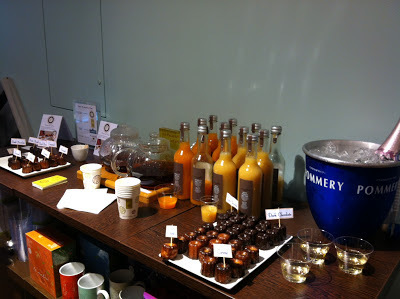 Yesterday evening two of my interests came together -- tea and French culture -- at the French Your Day party at the Le Palais des Thés SoHo boutique (LPdT). I wished I had continued my French language courses! I was fortunate to receive an invitation to the press party from Fraîche PR. The French Your Day concept was a showcase of pairings of LPdT teas, Alain Milliat juices, Plantin truffles, Canelé by Celine canelés, Pommery Brut Royal Champagne, and Baumes des Anges herbal syrups for breakfast or brunch, afternoon tea, and cocktail hour. I was immediately drawn to the juices. The humidity of the day followed me into the shop. Also, I like glass bottles. The size and shape of these make them easy to handle. I preferred the apricot juice but the white peach juice paired well with the caramel canelé. The juices are fruit forward and thick but smooth; no pulp here. The caramel canelé was perfectly caramel. I think the chocolate canelé would be a good dessert pastry. It tasted like a warm, moist brownie. This was my first time eating canelés. Canelé by Celine founder Celine Legros told me that she is the only person making canelés in New York. You won't find her canelés at a farmer's market; she prefers more refined venues. Celine sells her pastries online but is looking for a permanent shop. Check the website in September as she might be offering a baking course. I sampled the two teas breakfast teas: Thé des Lords and Big Ben. The latter was my favorite of the two. Notes of chocolate, almost Puerh-like but it is a blend of Yunnan and Assam. The flavors lingered on the tongue. Thé des Lords is an Earl Grey - not a tea I usually drink because of the strong bergamot flavor - but the bergamot in this tea was surprisingly mild. Afternoon tea à la française offered a refreshing surprise. 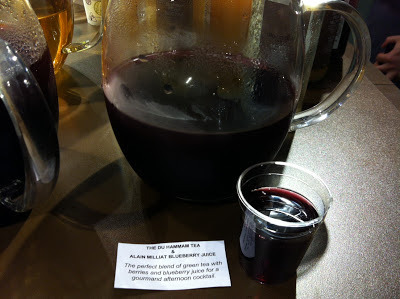 Would you combine flavored green tea with blueberry juice? I would not have before last night. Thé du Hammam combines seamlessly and tastily with Alain Milliat's Blueberry Juice. I wish I had sampled all the Milliat juices! I missed the Summer Pear, Raspberry, and Mandarin Juices. On its own, Thé du Hammam is fabulous. I can see why it is one of LPdT's most popular teas. ...our flavours are born of an exclusive extraction method which captures the taste and fragrance of fresh aromatic plants, herbs, flowers, trees, spices and vegetables. 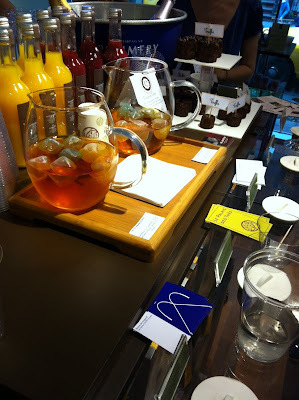 The syrups were mixed with sparkling water. I sampled both the Lemon-Basil and the Carla Lavender mixed with soda water and the Lemon-Basil straight-up. I really enjoyed the former. These syrups would be fantastic ingredients in your favorite cake or muffin or other baked good. The tea selection for this course were iced, but not with traditional ice cubes. Thanks to Sara for pointing this out. Can anyone identify the type from the above photo? Both teas contained rooibos which is my current favorite tisane. I am sensitive to caffeine in the evenings so I would prepare Thé des Vahines Rooibos over Thé du Hammam Rooibos for my cocktail hour. I also thought the former had a better balance of flavors. You smell the vanilla but taste the almond with the rooibos providing a good level of sweetness. 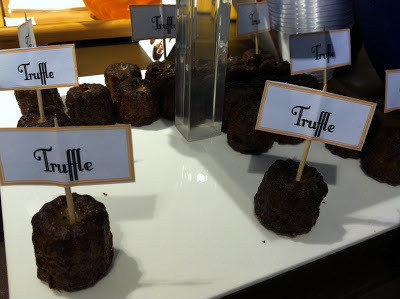 The best thing I ate at French Your Day was the Black Winter Truffle Canelé. The pastry is small but packs a lot of flavor. Furthermore, the savory taste is unexpected from a pastry-shaped food (pastries are supposed to be sweet, right?). Finally, after lots of virtual interactions, it was a pleasure to meet the Fraîche PR staff, and Sara of Tea Happiness and Nicole of Tea For Me Please.